For the bundle that will steal your heart, commemorate her birth with this amazing Aaron Basha baby shoe from the Baby Shoes collection. The shoe is forged in 18kt white gold and treated to a white enamel finish. 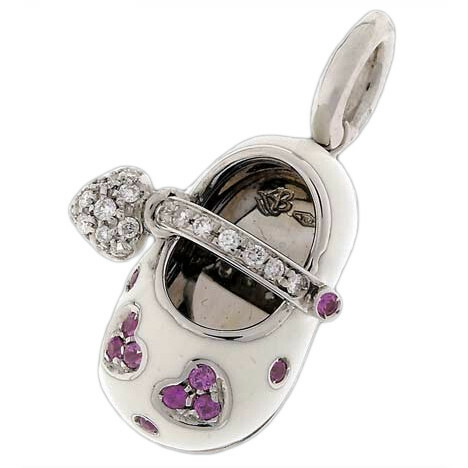 Lovely pink sapphires create hearts on the toe of the shoe and are sprinkled around as well. A diamond strap, complete with a white diamond dangling heart, finish this wondrous charm. So precious, this Aaron Basha charm will captivate any charm bracelet or necklace with ease.